The first installment of small expansion-pdfs for the Spheres of Power system clocks in at 4 pages, 1 page front cover, 1 page SRD, 2 pages of content, so let’s take a look! -Branding Taboo: By spending a spell point, the blast automatically affects a target in range; the target gets a brand and the caster specifies a general forbidden action, with the GM as arbiter as what does and doesn’t go. A list of suggested prohibited options or more detailed examples would have been nice here. The target is aware of this prohibition, which lasts for level rounds; I assume caster level to be intended here, analogue to the talents in the base book. At the end of any turn after executing the prohibited action, the target is affected by the blast, unless the target makes a Will save. A given target may only have one brand at a given time. Tying the brand to Will save is weird in my book and makes for a pretty potent effect. I assume that (blast type) remains consistent throughout the rounds of the duration, if any. -Destructive Maw: Shape destructive blast as a swift action into a bite attack. “this bite attack functions normally in all respects, except instead of dealing damage and effects as normal for your destructive blast.” This lasts 1 round per caster level, and (blast type) talents need to be applied upon shaping, and may not be reassigned. Öhm. Yeah. While no longer at range, this allows you to combo REALLY nasty stuff, and the interaction between bite and blast is anything but clear. Str-mod? Multi Attack? Blast shape interaction? Nope, “functions normally” is not nearly precise enough. -Energetic Affliction: Spell point use for auto hit sans attack roll. Lasts 1 round per caster level. Target takes damage at the start of the round on a failed Fort-save. Two consecutive saves end it; alternatively, the target may use a full-round action to make a Ref-save with +4 to end the effect. Does the Ref-save happen at the start of the round? Or after taking the full-round action? Also: This does not have the limitations of Branding Taboo regarding consecutive effects, which can make this rather brutal. -Energy Nova: 10 ft. +5 ft. per 5 caster levels burst blast, Ref for ½ damage. Excludes caster at his/her discretion. -Energy Rift: Choose a corner from a square in range and draw a 10 ft. + 5 ft. per 5 caster levels line; all squares must be in range. Everything in that line must take a Ref-save, ½ damage on success. -Mutable: Create an area of contiguous 5 ft. cubes, max 5 + 1 per 2 caster levels. One must be adjacent to you. Targets in the area must succeed a Ref-save, ½ damage on a success. This is really weird. It’s arguably better and easier to control than most blast shapes. Shouldn’t this one cost spell points to make up for the increased flexibility? -Damage Control: Change damage to nonlethal (or increases nonlethal damage output with (blast type); gets the interaction with damage types right. Also lets you forego damage. Damn cool! -Demolition: Better attacks versus inanimate objects. -Energetic Response: Make AoOs with destructive blasts, with a reach of 5 ft., + 5ft. per 10 caster levels. You may execute these as melee touch or ray attacks. (Blast shape) may not be applied and this type of blast doesn’t provoke an AoO. -Spirit Blast: Blasts affect ethereal targets and incorporeal targets normally, negating the defense-boosts. Editing and formatting are very good on a formal level. On a rules-language level, the pdf is good, but not as precise as usual for the author. Layout adheres to a two-column full-color standard and the pdf has a single stock artwork. The pdf has no bookmarks, but needs none at this length. Amber Underwood’s talents are interesting, though I also found them to be internally inconsistent in the power levels they offer, falling on the more potent side of things. I’m not sure I’d allow them in all my games. The pdf also has a few instances where it could have been more precise. My final verdict will hence clock in at 3 stars. 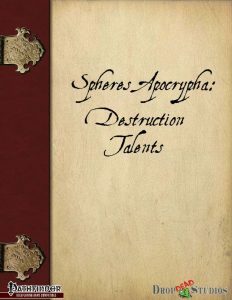 Missed the big Destruction Sphere expansion? You can find it here!